It’s Saturday morning. The weekend has officially begun. Sunshine streams through the thinning branches of trees, illuminating the brilliant gold, red, and orange leaves. You pour your-self a cup of coffee as you wait for your significant other, ready for a festive fall date. 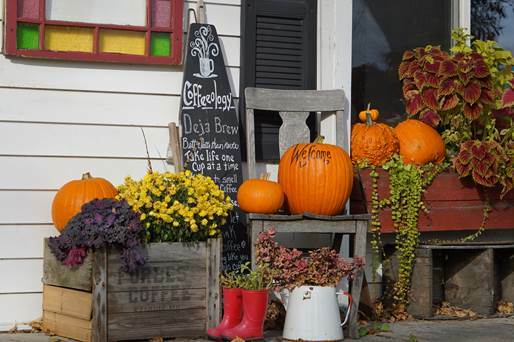 Lulu Beans always has lovely fall décor to give their guests a warm welcome to the coffee shop. Plus, it makes for an ideal backdrop for any fall-themed photos you might be hoping to take with your pumpkin spice latte. You could go to Lulu Beans, where you would sit in comfy armchairs, sipping warm chocolate chai and sharing a candy bar scone. There are a few books you would exchange in Lulu’s library, swapping those old books for a few new finds that other people have brought in. Then the two of you could enjoy the last few sips of your chai as you stroll through the neighborhood, scanning the ground for a few perfect leaves to press in between the pages of your new (used) books. You could drive over to Stacy’s Nursery & Floral in Willmar in search of some fall décor items or that perfectly sized pumpkin for carving. Stacy’s two friendly black Labradors would keep you company as you wander through the expansive greenhouse and admire the fall-themed floral arrangements with pinecones, gourds, and plenty of autumn leaves. You would find a plump, healthy pumpkin, perfect for carving later on in the day, say goodbye to your four-legged friends, and be on your way. With warm cider by your side, you could enjoy an afternoon of carving pumpkins and watching Halloween movies. 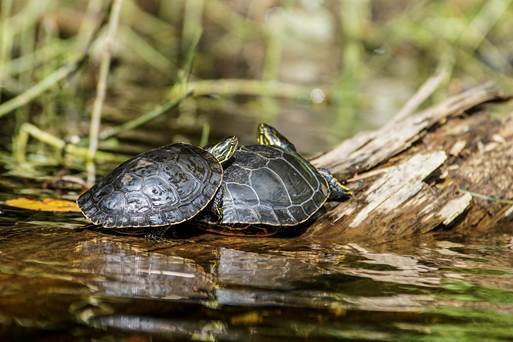 A pair of turtles resting on a submerged tree at Sibley State Park, bathing in the sun and taking in the crisp air of fall just like you and your hiking date. You could pack up your cooler for a picnic in Sibley State Park. You would hike the trails, finding the perfect spot to spread out your blanket and enjoy cheese and crackers, apples and peanut butter, and of course, a bottle of sparkling cider. Walking down to the docks, you could lay on the warm wooden planks and peer down into the shallow water to watch schools of minnows twist and turn in random sequence. You’d keep an eye out for deer as the sun sets, finding a few grazing on the open prairie before you head home. Or you could bring your picnic lunch to Glacial Ridge Winery in Spicer, enjoying the rolling hills of the orchard and taking a few Instagram-worthy couples’ pictures with the orchard as a backdrop. Of course, you would partake in a wine tasting while you were there, taking full advantage of all that the winery has to offer. A casual stroll along the Glacial Lakes State Trail and a lovely conversation with your mate is a perfect way to enjoy a fall day. 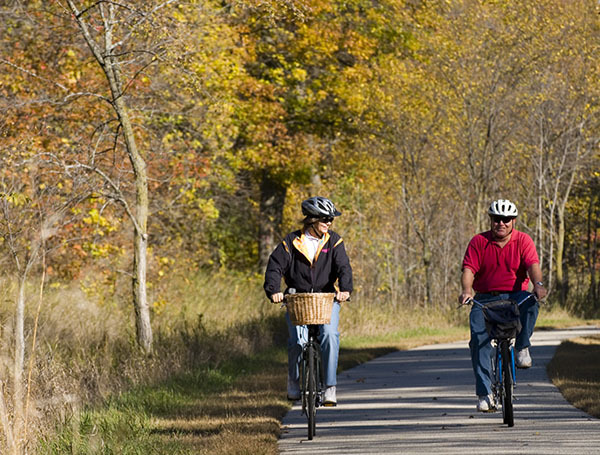 You could bike the Glacial Lakes State Trail, zipping across the warm pavement and watching the leaves fall lazily from the trees above. It would be a great way to get your exercise in while enjoying yourself, out in the cool fall weather and breathtaking autumn scenery. You’d pedal all the way to downtown New London, where you would stop to enjoy a refreshing pint of Dazzler Fresh Hop, a harvest IPA at Goat Ridge Brewery. You would certainly stay for a while, playing a few board games with the quiet gurgle of the river as a comforting background noise. Regardless of what you choose to do, today is going to be the perfect day. 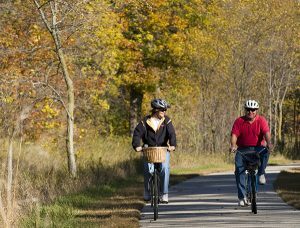 With an abundance of options to choose from in the Willmar Lakes Area, there are no limits as to what you and your significant other can do to enjoy the seasonal weather on your ideal fall date.